> I'm in the same position. > really have time for anyway). > that's a lot of money over the year. > extortion, I'm not sure how it's legal. I've just had an email from NowTV for what looks like a 9 month pass for the F1 channel for £150. I haven't decided if I'll take it up. It's less than half price but I also have to consider that due to my job I can't watch all the races live anyway. That's getting the stage where it's almost palatable, but the last time I used the Now TV app for Windows you couldn't change the screen it was shown on, so I couldn't stick on the TV. No idea what the app on the TV is like either, and I'm not willing to subscribe to test it. If F1 was in better shape I'd consider it more, but I'm finding it really difficult to get enthused about it at the moment. I used to be giddy at this stage of the year, but I'm not even mildly excited for Melbourne yet. I use NowTv via my apple devices and it airplays well enough. There's a slight delay of a minute or so in the coverage so takes some fiddling to synchronize it with the live timing. I'll be surprised if Grosjean keeps the Haas seat next year. With the exception of Austria, he's been abysmal this year, seemingly running into anything that's moving and a lot of things that aren't. He's always been mistake-prone but this has been a new level of fail. Magnussen must surely be Haas's ideal choice going forward. On the subject of TV, I have Sky F1 through Virgin Media on my flatscreen TV, which makes a great home cinema in the living room of my flat. I know other deals are cheaper, but I find it more practical to watch TV the old-school way than to try streaming the live feed through my devices etc. I've done it in the past - most often watching the live Sky stream on my laptop - but I've found that both the airplay itself and the WiFi signal are too prone to glitches to show whole races reliably. Edited 6 time(s). Last edit at 07/21/2018 05:02AM by EC83. Edited 2 time(s). Last edit at 12/05/2018 12:34AM by robracer. Well it’s all over for another year. I have to say that I think Hamilton deserved it this year and he’s really elevated himself from the top group of drivers in F1 to being the top driver of F1. Its a shame that Bottas slumped again, he did have some very strong performances early on but he ultimately lacked the consistency and simply did not manage to put it altogether. Under pressure next year as he risks being dropped in favour of Ocon. 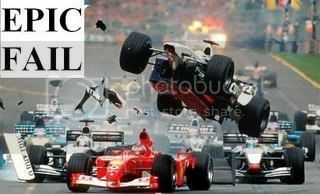 Ferrari imploded again. Vettel made far too many mistakes and Rosberg would point out you simply can’t make mistakes against Hamilton. It was also amusing seeing the team get outdone by Mercedes in the art of team orders. Nice to Raikkonen get one last win but i’m excited that they’ve chosen to promote Leclerc as he ought to put the cat amongst Vettel’s pigeons. Thoroughly deserved title for Hamilton, in a car that I felt was inferior to the Ferrari for many parts of the season. Can't recall any bigger mistake he made all season. Unlike Ferrari and Vettel, who looked strong early on, before they completely fell apart. Turning point was Hockenheim in my opinion, a race that Vettel looked set to win, before throwing it away in Sachs. Bottas is an embarrassment, nothing more nothing less. Sure the car wasn't as superior as in previous seasons, but still 0 wins to Hamilton's 11 is incredibly poor. If not for Hamilton's perfect performances, and Ferrari's often sloppy ones, Mercedes wouldn't have won the WCC. Arguably Mercedes didn't want the tensity they had during the HAM-ROS years, but they should at least put in a driver who can get results when the opportunity arises. Fingers crossed that Renault makes a big step forwards off-season, so that Hulk finally can get his first podium. This is what the championships would look like if points were given out for qualifying positions, so basically under the current system if a driver makes it into Q3 they get points.